Here’s Proof that Afterschool and Summer Programs Work! Did you know there is a connection between health and education? Research shows that better-educated individuals live longer, healthier lives with reduced risk of illness – and their children are more likely to thrive and be successful in school. As part of the Bold Goals Coalition’s work to improve health in Central Alabama, the Walker County Health Action Partnership collaborates with Walker County Schools to improve both the health and education outcomes of students. In September 2016, United Way of Central Alabama (UWCA) and the Walker County School System were awarded a three-year $450,000 21st Century Community Learning Centers (CCLC) Grant ($150,000 annually) to enhance learning at Oakman Middle School. 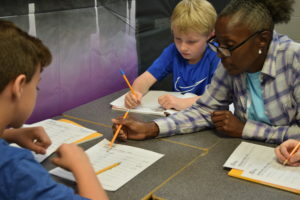 Under a joint application, Walker County Schools, UWCA and YMCA of Greater Birmingham provide afterschool and summer-program services to Oakman students. In addition to academic enrichment, participating students also receive health education, fun physical activity opportunities and a healthy dinner every day during the after-school program, as well as breakfast and lunch during the summer program. Now, following the second year of grant funding, we are proud to share these positive results, thanks to the project’s external evaluator, Spectrum RED. Among participating students who were tested in both 2017 and 2018, there was a statistically significant increase in their average STAR scores in both math and reading. Afterschool participants saw a 20% decrease in average unexcused absences from the previous school year. 100% of parents/guardians agree or strongly agree the program provides a safe space for their child to learn and have fun. As part of the 21st CCLC at the school, a five-week summer program called Power Scholars Academy was also offered to not only tackle summer learning loss in math and reading, but also to foster physical and social-emotional growth. The program was created to boost students’ academic achievements, self-confidence and social skills while encouraging healthy lifestyles and engaging parents in their children’s education. The Power Scholars Academy provided children with rigorous academic instruction and fun, camp-like enrichment activities and field trips. This year’s theme was “Around the World in 30 Days” and scholars learned about various cultures and continents throughout the summer. Many thanks to the Bold Goals partners working to improve the academic and health outcomes of students at Oakman Middle School! To learn more about the Oakman afterschool or summer programs, please contact Elyse Peters, Walker County Health Action Partnership Coordinator at United Way of Central Alabama, at epeters@uwca.org.